The garage used to be an afterthought, but, in recent years, it has become a main focal point in home design. Boosting curb appeal, the garage is a place that you and your guests see every time you pull up to your house. You can make a garage more than just a place to store junk. It can now be a functional room of the house if you want to maximize your garage space and make it visually appealing. The outside and inside style of your garage may depend on how you want to use it and the size that you have available to you. Read on for more details. Some people use the garage purely for storage area, but this doesn’t have to be as boring as it may seem. Rather than simply throwing tools, car parts, sports equipment and camping gear and other types of goods into the garage, why not make it more organized and visually appealing by putting up nice wire racks along the sides? This way, you can separate out the material in a way that’ll allow you to know where you have out certain items, and it’ll not be an eyesore each time you open the door. Another idea for those who like a more traditional, country feel is to put wooden bookshelves along the walls. This can create a more homey feel and take away from the metal look of wire shelving. If you’re more into the idea of making the garage into a fun area, you can turn it into a place where you and your guests can hang out. Try adding some rugs, posters and even window treatments to make it seem more inviting. You can then add in foosball, a pool table or any other type of game. For an award-winning look to your garage, a sofa in the corner and a wall-mounted television really makes the garage look fun. A garage should usually be of a certain size. If it’s too small, you can’t fit a car or use it as you’d like to use it. Nobody wants to scrape the side of their car along the garage or have the doors shut on the bumper because the car is hanging out. Plus, people want to be able to store items alongside a car. At the same time, if it’s too big, you may be cutting into the size of other more functional rooms. The average size for a garage door is about 8 feet wide. If you want a little bit more space, you can opt for 9 foot wide doors. In terms of height, most garage doors run about 7 feet or 8 feet high. For extra money, you can always get a garage with a higher ceiling, but custom-made garage doors do tend to be expensive. For a two-car garage, the shortest width usually runs around 14 feet, although they more often are 15 or 16 feet wide. Even a foot or two on both sides, going up to 17 or 18 feet, will allow for a bit extra storage. The door that goes into the house from a double-car garage should be at least 32” wide for the look to be overall symmetrical. Many states have building codes with minimum sizes for garages. For example, in California, the inside of the garage must be at least 10 feet by 20 feet per car. This extra room allows you to open the car door while the car is parked inside, and it also allows for someone to easily get by if there were an emergency. 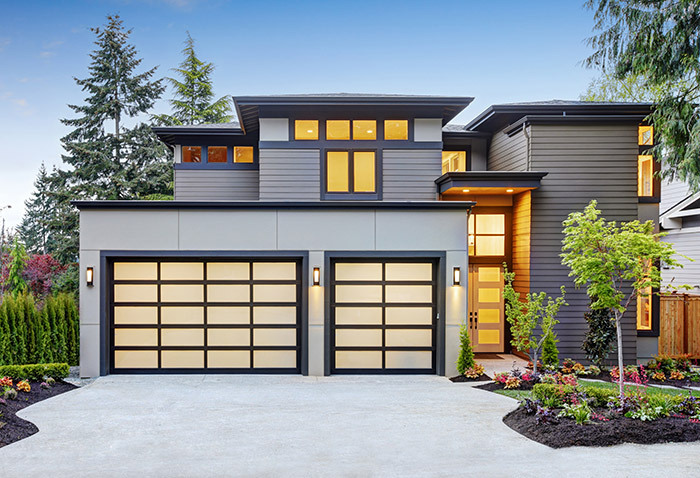 There are a ton of garage door styles that suit different tastes. What’s important is to find one that can be streamlined into the overall look of your home. Rather than neglecting the garage door, opt for one that either emboldens the overall look with a daring color, or one that complements the rest of the house. This style of door has become popular in recent years, with both millennials and more mature populations. It combines a traditional, almost country look that gives off a retro feel, with an air of elegance and strength. The carriage-house style can be made of steel or aluminum or even wood for a traditional look. Special carriage-house straps or knockers can add a nice decoration. Muted colors like white and brown go well with this style. 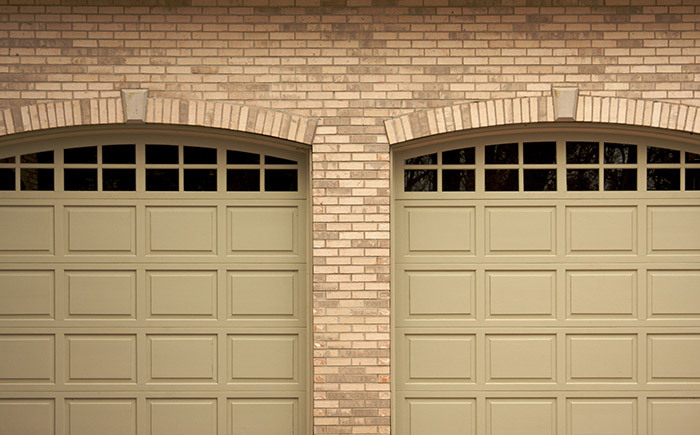 A traditional garage door will roll up rather than rolling to the side like a carriage-house style door. Far from being boring, you can make a traditional door more elegant and stylish with a few easy touches. If the carriage-house style doesn’t mesh well with the look of your home, a standard steel garage door can be made fancier with some windows and trimming. One or a few windows at the top of the garage door can provide natural light and ventilation, if operable, to the inside of the space, and they add to the overall visual appeal of the door. If you’re concerned about privacy, the windows can be frosted or tinted. In certain areas where homes compete for the most modern look, homeowners may opt for a ton of windows. You can even go for a garage door that is made up of paneled windows to show off a nice car. One booming garage door business is the tech industry’s new smart garage doors. Sensors are out on the market that work to detect when your car is pulling into the driveway so that they can automatically open. Similarly, the doors will close when your car pulls out. If you want to use your garage as a more functional space, consider getting insulated, weather-resistant doors. These kinds of doors will allow you to not be so cold when you’re inside the garage, and they’ll also help to keep out unwanted pests and critters. If you want to add to your house in a fun and functional way, consider re-vamping the inside and outside of your garage. Either go for a new use of the space by organizing it in a neat way, or make it into a fun room. Another possibility is to change up the doors so that you can streamline the look with the rest of the house. 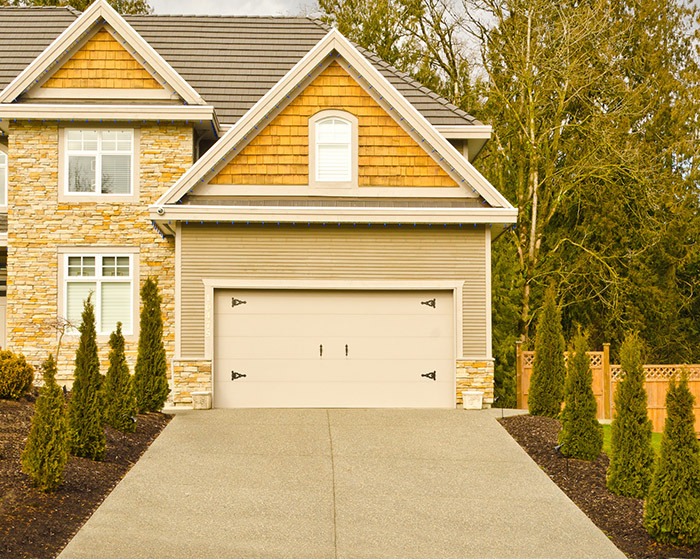 No matter what change you make, your new garage will add value to your home and major curb appeal. For Peoria homeowners, you can’t go wrong with a solid, beautiful steel garage door. When you choose Feldco, you’ll have many styles and color options to help create your dream garage door. Get a free quote now and join the over 350,000 homeowners who trust Feldco.